June 2018. With 472 gigawatt thermal (GWth) installed at the end of 2017, solar heating and cooling was again the largest solar sector worldwide followed by Photovoltaics (402 GWp) and Concentrating Solar Power (5 GWel). The new report, Solar Heat Worldwide, highlights as well the increasing use of megawatt solar heating and cooling solutions for large public and private buildings as well as factories. The annual report was launched at the end of May by the IEA Solar Heating and Cooling Programme (IEA SHC). Lead author is the Austrian research institute AEE INTEC. With data from 66 countries, it is the most comprehensive annual evaluation of solar heating and cooling markets worldwide. In 2016, the global solar thermal sector employed 708,000 people and reached a global turnover of EUR 16 billion (USD 19.2 billion). “More and more countries recognise that solar thermal district heating is the most cost-effective way to decarbonise the heating sector”, explains Guthrie. The first SDH installations above >500 m² (350 kWth) came online in France, Serbia, Australia and Kyrgyzstan. In total 15 large-scale solar thermal systems were added in 2017 mostly in the established markets as Austria, China, Denmark, Germany and Sweden. For the first time parabolic trough collector technologies were used for feeding energy into district heating networks. The largest installation started operation in Inner Mongolia in October 2016 (75,000 m2) followed by a Danish installation with 26,929 m2 in the municipality of Brønderslev. 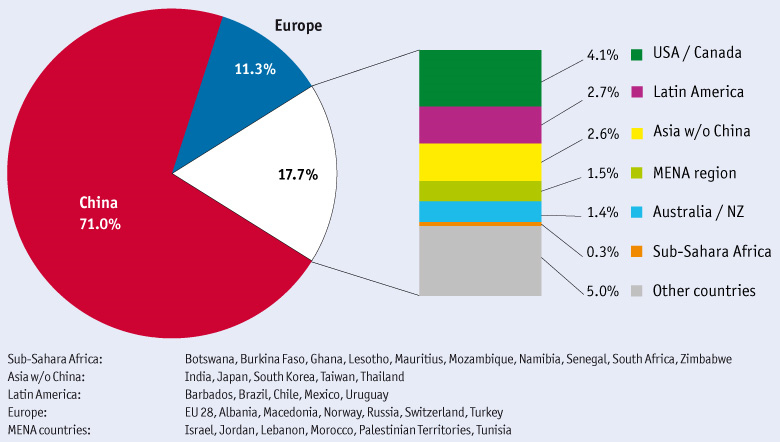 Collector technology depends on the region: Vacuum tube collectors dominated the global solar thermal capacity in operation (71.5%), whereas flat plate collectors are most common in Europe (82.9%). 1 Unglazed, glazed flat-plate and evacuated tube collectors with water as the energy carrier as well as glazed and unglazed air collectors are considered. 2 Glazed and unglazed water collectors are considered. China and Europe were again the largest solar heating and cooling markets 2016. Increasing demand for large-scale systems for solar district heating and large residential, commercial and public buildings worldwide – annual achievements and cumulated area in operation in 2017.